The natural way to eliminate static without the use of any chemicals. The all new anti static ball for all natural static cling free clothes. No more remembering the fabric softener every time No more messy and inconvenient dryer sheets. Just keep the anti-static ball in your dryer and dry your clothes like normal. Leaves you clothes soft and static free. This ball contains no fragrance or chemicals. You may add scent if you wish by placing a drop of fragrance into the foam of the ball, or you can use it with no scent at all. Just one works wonderfully - no static with any materials. I thought the deal was 2 balls, but since one works well . . .
No more snuggle, no more bounce. The best thing to keep static off your clothes is to put an Anti Static Ball in the dryer. I am not sure how it works, but I no longer have static cling from my dryer. 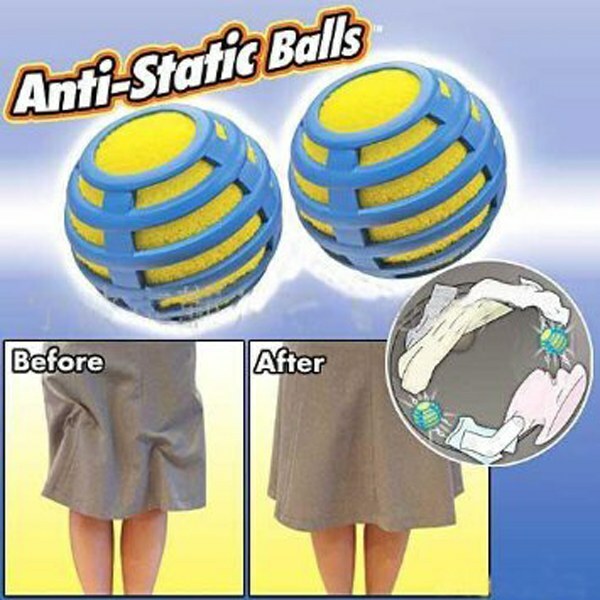 It is amazing how these Anti Static Balls just take the static out of everything!! !